There is much more to Chicago than just its towering skyscrapers and scenic Lake Michigan coastline, with the city actually being home to a number of spacious parks and pretty gardens. The Chicago Botanic Gardens serve as a particular horticultural highlight and reside on the northern side of the city, close to the neighborhoods of Deerfield, Glencoe and Northbrook. Located just behind the Museum of Science and Industry, within the Kenwood neighborhood, Jackson Park opened in 1893 for the World's Colombian Exposition. Covering over 300 acres / 120 hectares, Grant Park offers a relaxing green area with many possible activities, while the sports facilities in Lincoln Park are quite extensive, as is the magnificent conservatory and its tropical contents, built in the 1870s and relocated to its current situation in 1893. The city's splendid Botanic Gardens have long been one of the principal tourist attractions in the city, attracting around one million visitors every year. Covering almost 400 acres / 162 hectares, these beautiful gardens include 81 acres / 33 hectares of waterways, nine islands, 15 acres / 6 hectares of prairie gardens and literally hundreds of acres of woodland. The grounds are located in the suburbs of the city and there are 20 separate themed gardens and three native habitat areas on offer, including traditional Japanese landscaping, formal English-style rose beds, hills, flower borders and many exceptional plant specimens. The Botanic Gardens provide the ideal place for a picnic and remain an especially peaceful spot. There is also a restaurant, café and car parking. Originally a small public cemetery to the north of downtown Chicago, these parklands were converted into one of America's finest public parks in the 1860s. Over the years Lincoln Park has grown from 60 acres / 24 hectares to over 1,200 acres / 485 hectares and is simply vast. Visitors will find excellent recreation facilities, such as 15 baseball areas, six basketball courts, two softball courts, 35 tennis courts, 163 volleyball courts, field houses and a popular fitness center. 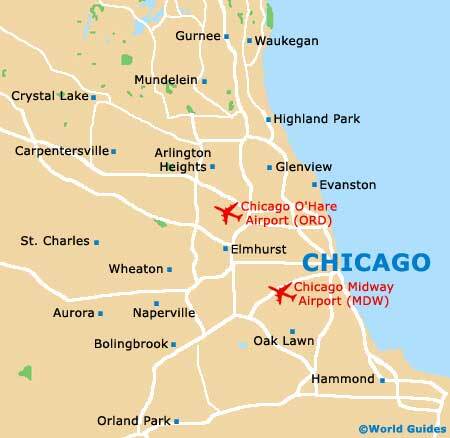 There are also splendid landscaped gardens, a theater on the lake (with regular outdoor performances in the summer), a butterfly house and Lincoln Zoo, which ranks amongst the largest zoos in America. The Lincoln Park Conservatory is situated in the beautiful Lincoln Park, being located to the north, near the West Fullerton Parkway, the Peggy Notebaert Nature Museum and the North Pond Nature Sanctuary. Featuring many impressive exotic and tropical plants, flowers and trees, the conservatory boasts an outstanding collection of tropical palms, a colourful orchid house, a lily pond, a fernery and also a show house, which has many seasonal exhibitions. In total there are four different display halls, a large vestibule and some 15 rooms used for growing and propagation purposes. Highlights at Grant Park include soccer fields, volleyball courts, softball fields, tennis courts and ice skating at the Daley Bicentennial Plaza during the winter months. In the summer, the beautiful gardens are in full bloom and very fragrant. The park is also home to the Field Museum of Natural History, the Adler Planetarium and the Buckingham Fountain, which features a mind-blowing 133 water jets. Jackson Park is one of the most spectacular public parklands in Chicago and these spreading grounds were actually designed by Fredrick Olmsted, who also had a key role in designing New York's famous Central Park. Jackson is the perfect area for picnics, walking and jogging, and is also home to many wonderful attractions, such as its traditional Japanese gardens, complete with large pools and a teahouse. There are also several beaches that border Lake Michigan and provide a great place for sunbathing and swimming in the city. These include both the 57th Street and 63rd Street beaches. This attractive and small parkland is a peaceful place to relax, with visitors coming here to enjoy the pleasant green surroundings. With pathways, benches, play areas and open spaces for sports games and sunbathing, the lawn is called home by two rather stylish sculptures. Of note, the popular Museum of Contemporary Art is situated right next-door, with many interesting exhibitions of modern art being staged in this gallery. Washington Park is situated in the southern Kenwood district, where it comprises a large number of attractions, such as the Sunken Garden. These also include footpaths, ponds, streams, fishing, sporting facilities, huge water slides, pools and fountains, while the DuSable Museum of African American History is also situated in the grounds. Originally built as a sister park to the city's Jackson Park, Washington Park was established in the 1870s and today sponsors many popular events, including dancing, arts and music. The impressive sculpture named the 'Fountain of Time' is well worth looking out for. 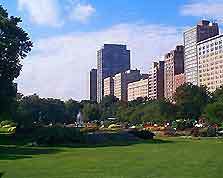 Situated on the south side of the city, Abbot Park lies next to the grounds of the Chicago State University, just of the Dan Ryan Expressway (I-94). With many sporting facilities, including tennis courts, basketball courts, football fields, soccer fields and a playground area for children, this park also has some attractive landscaped gardens. Many popular events are hosted here each year, such as concerts, theatrical performances and dancing classes. The vast Calumet Park is situated on the south side of Chicago, close to the Skyway Interstate I-90, where it dates back to 1905 and covers almost 200 acres / 81 hectares. Visitors will find a beach area, softball fields, football fields, baseball pitches, tennis courts and a range of other sporting activities. There is also a nearby field house where indoor activities and sports are practiced. In 2003, Calumet Park joined the National Register of Historic Places.